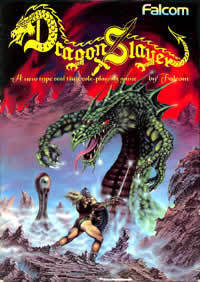 Dragon Slayer was released in Japan in 1984. It was later ported to Game Boy (1991) and Saturn (1997 Falcom Classics). It is officially labeled as role-playing game, but it is rather an action-adventure game. Dragon Slayer is officially labeled as a role-playing game, but it actually lacks almost all of the characteristics of the genre. First of all, it is completely devoid of any text, dialogue or interaction with peaceful characters; furthermore, it also lacks any permanent upgrade to the hero's attributes: enemies can not only steal any item in the hero's inventory, but they can also permanently reduce his attributes. Because of this and because of other gameplay elements, Dragon Slayer definitely falls into the the definition of Action-adventure game. Its sequel, Dragon Slayer II: Xanadu is even more obviously a precursor of The Legend of Zelda, a well-known series of Japanese action-adventure games (the latter are often described as "role-playing games without experience points"). This page was last edited on 17 March 2019, at 09:24.